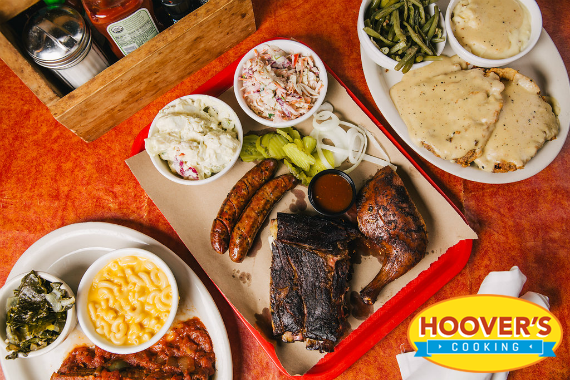 A force in the Austin community, Hoover’s Cooking has been serving up honest-to-goodness good cooking since 1998. The assortment of flavors on our menu strive to bring together the melting pot of cultures and people who make up this great state. "@Texarchivist what a great shot, Susan! Thanks for sharing!" "@MssGault No problem! And in that case, you should definitely give our Beet-A-Rita a try and let us know what you think. " "@MssGault It's our original recipe with beet puree and a taste you can't beet! Feel free to ask a server to find the right drink for you." "@MssGault it's our Beet-A-Rita! ??" "If you think this looks good, wait 'til you see our e-mails. https://subscribe.mainstreethub.com/email/ef8656b7-7e41-4a4b-b209-2f70975512b0"
Austin Original! Home Cooking.. Do I say fried chicken anyone?! Love this place. Pretty good but seems worn out in terms of being something special. Yes, I'd like to receive news from Hoover's Cooking. Sign up for the Hoover's Cooking Newsletter!